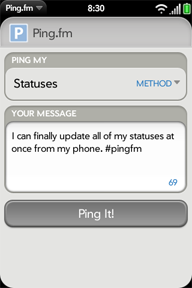 HP just approved my updated version of Ping.fm for webOS. Cross-app launching was suggested by Marc (@ScienceApps) in order to provide support for posting via Ping.fm inside his Lithium Messenger and Multiple App Launcher apps. method No The service, trigger or group to post to. title No Title of the posted message, if required or supported. message No The message body. I've also implemented a workaround for an inconsistency in the Ping.fm API that prevents posting to certain groups. As usual, the up-to-date source is in my subversion repos. This article was published on April 6, 2011 at 17:54:44 PDT.